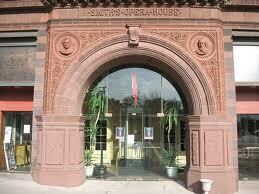 At the Smith Opera House entrance, you are greeted by Edwin Booth, upper left, and William Shakespeare, upper right. Over the years, thousands upon thousands — maybe even into the millions — of people have walked through, seen a show, and shared a laugh at the Smith Opera House. Their faces have been lit up by the Art Deco fixtures in the lobby and balcony, and their laughs have rung out throughout the auditorium. But, after the theatre goes dark and the doors get locked, some faces still remain. Four important ones, to be exact. Though, three if you want to get really technical.You see, there are faces all over the Smith, waiting to welcome you to an experience unlike any other. Right above the front doors as you walk in, Edwin Booth and William Shakespeare look down in their restored state, the way they would have looked 125 years ago. We all know and love Shakespeare as the Elizabethan playwright who gave us such theatrical icons as Romeo and Juliet, Hamlet, and Othello. Back in 1894, Shakespeare was seen as the epitome of theatre. So, it would only make sense that his partner on the archway would be the actor that in 1894 epitomized his roles. Edwin Booth was a famous Shakespearean actor in the second half of the 19th century. (He was also the brother of President Lincoln’s assassin, John Wilkes Booth.) Edwin Booth was most well known for playing Hamlet. He even opened his own theatre in New York City. He passed away in 1893, however. So, while it is currently unknown exactly why Booth’s bust graces the entrance, it is thought that because he was a paragon of acting, it was done so as a testament to him and his legacy. its renovation into a movie palace. Or, maybe, having Molière and Shakespeare in a theatre was thought to be good luck. Regardless of why they’re there, the next time you go to see something at the Smith, make sure to say hi to the faces, who are there to enjoy the show, too.